Now, incontinence is one less disturbance in your routine life. 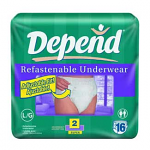 Drop that level of stress with Depend Incontinence Products & Supplies. It is time to get back to socializing, working, or having great family fun, and Sportaid offers a full line of incontinence products from Depends to add extra security in your life. Choose the right fit for your needs and focus on what will make you live a happier and more comfortable life. 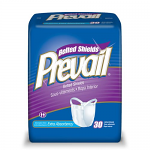 You can effectively manage incontinence with superior protection and discreet appearance by choosing from Depend Maximum Protection Fitted Brief w/ EasyGrip Tapes, Depend Guards for Men, Depend Adjustable Underwear, and Prevail Belted Shields. Select from the top manufacturers and save big with Sportaid.com's everyday low prices. 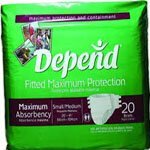 Browse through our premium selection of Depend Incontinence Products & Supplies or feel free to call 1-800-743-7203 for help choosing the right fit quickly and easily. You'll be glad you did! 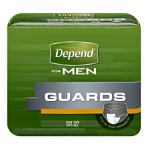 Save as much as 39% on Depend Incontinence Products & Supplies at Sportaid! Whether this is one of your first visits to Sportaid or you are one of our most loyal customers, we guarantee satisfaction. After over 25 years in the business helping people find Depend Incontinence Products & Supplies at the lowest prices we continue to lead the industry! We carry a large selection of wheelchair cushions, wheelchair parts, and wheelchair accessories. We are capable of beating any competitor's advertised price, just call! Our customer service staff has over 50 years of experience, plus over 90 years of combined wheelchair use experience. We look forward to working with you!